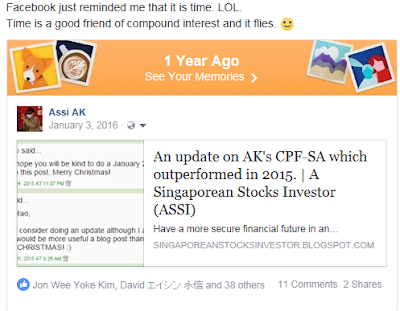 AK showing off his CPF-SA numbers again? I hope my blog has not caused too much trouble for the authorities. Just like my passive income numbers, my CPF-SA numbers seem to have garnered a following as readers reminded me on Facebook that it is time. Even Facebook reminded me that it is time. I guess sharing my CPF-SA numbers is inspiring to many readers and it helps them to stay the course. Er... OK, I am not quite sure what to make of the last comment (and some say I am cryptic). Anyway, although I thought I might skip it this year, a remark from a reader on FB gave me a nudge. AK was old, fat and ugly. Now, AK is old, slimmer and ugly. 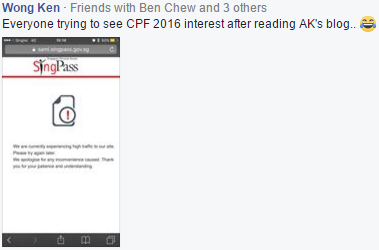 If by revealing my CPF numbers again, AK can be old, slimmer and handsome, OK, I do it. You surprised AK is like that? Hey, who wants to be old, fat and ugly? Cannot do anything about old but if can do away with the fat and ugly, that's two out of three! How much has my CPF-SA money grown from the year before? Worried about the projected 3% yearly increase in Minimum Sum (Full Retirement Sum)? How did this "miracle" happen? If you have to ask, you must be a new reader. Ask why does having more money in our CPF-SA and as early as possible make sense? See the related post at the end of this blog. Then, go to the right side bar of my blog to read more of my blogs related to the CPF. If you are a regular reader, you should be smiling now! Big thanks to your blog, please continue "self-chat" for year 2017. Is always a joy to read your blog. Please continue to share with readers your wisdom on investment. Have a healthily and wealthy 2017. Is is a joy reading your post. Please continue to share with readers your wisdom on investment. Have a healthy and wealthy 2017. Alamak. I am only talking to myself here in my blog. I never share any wisdom or investment here. -.-"
Is it true that ALL top-up monies + interest cannot be withdrawn even if we are well in excess of the enhanced retirement sum? e.g. we have $1M in RA, and ERS is 300k. the full 1M (less mandatory contributions) will turn into our annuity? Also, the annuity is calculated based on 20 years expectancy. If we pass away before the 20 year mark, is it correct to say there will be no savings left for our kids too? Your example is far fetched. If the ERS is $300K by the time you are 55, if you like, only $300K will find its way into your RA. $1m in the RA will never happen because at age 55 the balance $700K will either stay in your OA and SA or you could withdraw. 2. Worried you won't live to enjoy all your money? Building a cornerstone in retirement funding. I have clarified with CPF previously and they mentioned all top-ups (with its interest) cannot be withdrawn even if you have already hit ERS. i can only withdraw 300k, and 700k goes into annuity. Testing to see if I can send a comment. Glad it has worked for you too. No problem. Glad my information will be some help to others and help to clear some doubts. Originally thinking if I should email to you instead since a bit on the long side. Maybe even compiling more information as a guest post. But since I'm lazy, I rather skimp on the effort and just post as a comment. My blog receives plenty of SPAM, from money lenders, course providers etc. Most of the time, the program is able to differentiate bona fide comments from SPAM. Once in a while, something falls through a crack. -.-"
Just the previous long winded comment took me more than 1 hour since I research/check many times to ensure the accuracy of the comment. 'I choose a lazy person to do a hard job. Because a lazy person will find an easy way to do it.' - Bill Gates. Sure AK, if this will help to get the message to more audience, why not? Especially since I have seen this questions on withdrawal of top-up money coming up quite often. I believed a post can help to clarify on this matter. Just remove the comment then. For the folks who missed my comment that is removed by AK (because he is evil and don't like me. Joking, lol), please see the summary below. 1) I understand that first 60k earns an extra 1% with 20k from OA. How does the rest of the 40k get split between SA and MA? 2) For a person who is >55 years, he will earn an extra 1% on the first 30k of their CPF combined balance with up to 20k from OA. How do we know what is this combined balance? An extra 1% interest per annum is currently paid on the first $60,000 of a member’s combined balances (with up to $20,000 from OA). Extra interest received on monies in the OA will go into the member’s SA or RA to enhance his or her retirement savings. If a member is above 55 years old and participates in the CPF LIFE scheme, the extra interest will still be earned on his combined balances, which includes the savings used for CPF LIFE. These additional extra interest received on the OA will go into the member’s RA to enhance his or her retirement savings. If the member has participated in the CPF LIFE scheme, the extra interest will still be earned on his or her combined balances, which includes the savings used for CPF LIFE. 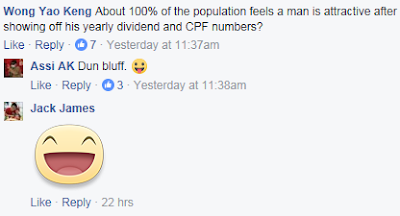 Withdraw CPF MSTU and interest at 55? If you do not have spare cash to top up the SA, then, OA to SA transfer is a good idea. You won't get any income tax relief in such a case. If you have spare cash and income tax relief is important to you, then, you might want to do cash top up to your SA instead of OA to SA transfer. Hello AK, just checking if you still find topping $7k cash per year (when young)into SA a good investment profile? Or is there other better ways for $7k per year?